Prayers, Pity, love and odas na im Nigerians for social media dey shower give singer and songwriter Aituaje Aina Vivian Iruobe AKA Waje. Dis na afta Waje hala come out say she fit quit musi because she no get di money to dey promote her work, especially her latest Red Velvet. For one video wey dey inside her Youtube channel and wey don full everiwia for social media, di singer dey complain bitterly say she dey frustrated and she don tire, she no believe again say dis music tin dey work. 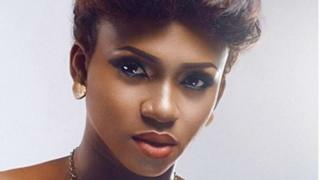 Waje post video wey she title; 'Music no be for me'. Nigerians no waste time to react as soon as di singer complain about her palava. Dis new revelation from Waje, come make plenti pipo dey wonder how artist dem for Nigeria dey struggle to make am, especially female musicians. While some dey show waje love, odas dey pray for am, some odas dey say make pipo no show pity for am, while some pipo dey debate on top di mata. Waje don dey for di music industry for for long, she feature for P-Square hit track wey dem title "Do Me", She follow M.I sing im "One Naira hit song and don share di stage wit artists like Wyclef Jean for South Africa, She don collabo wit Dencia on "True Love". She released her self-titled debut studio album in 2013. Waje recently start one media company wit her friend and industry mate, Omawumi, and dey just release dia first film titled 'She Is'. Two of dem featured for di movie.